April 29—First Quarter Moon: Manifesting. Taurus is a fertile sign. Whatever we want to bring into being at this time, we also want to infuse with stability, steadfastness, and grace. There are moments we are able to fully experience the pleasure of these qualities and at other moments we are off center and unable to remember this delight. During the manifesting phase of the Moon, we experience challenge—a give and take. Roadblocks might come from outside forces like a boss, a friend, a relative, or they might come from personal demons like fear, shame, or despair. What are you noticing about your challenges? When an obstacle appears, what is your reaction? These patterns can be changed. The First Quarter Moon phase is about the battles we need to fight to manifest intention. May 4. The last day of the Gibbous Moon is punctuated by Moon in Libra contacting Saturn in the middle of the day* and then several hours of a void of course Moon where energy slows down and deepens until the Moon enters Scorpio in the early evening. The lightheartedness of the previous day shifts into a more serious tone. Pay attention to what matters most to you. Is it a relationship? An injustice that really bothers you? A desire to bring more balance into your life? Whatever it is, this is Saturn’s work for you. 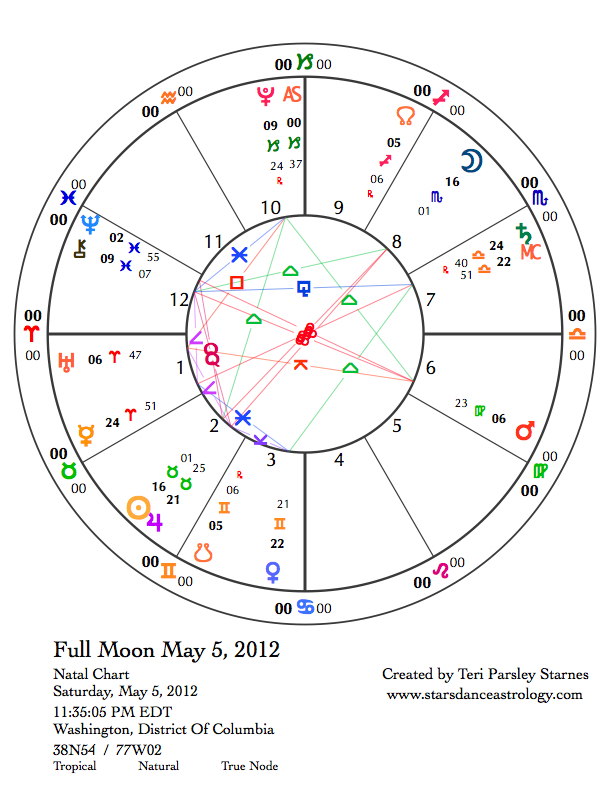 May 5—Full Moon: Illuminating. Full Moons bring understanding and release. The understanding offered by this Moon is the integration of opposing signs—the Sun at 16° Taurus and the Moon at 16° Scorpio. This season of Beltane is mirrored by the opposite season of Samhain—the end of the growing season when the green world retreats and Winter begins. This is the Full Moon of Death and Rebirth. The Scorpio Moon tinges our experience of beauty and youth with the realization that everything dies eventually. The cycle of life, death, compost, and rebirth is powerful. It deepens and matures our intention to live with the Taurean qualities of stability, steadfastness, and grace. Mercury opposite Saturn. Along with the integration of life and death themes at this Full Moon, Mercury in Aries and Saturn in Libra invite us to balance another pair of opposites: the expression of self-reliance with the commitment to partnership and interbeing. We might experience this opposition as frustration in communication or a sense of isolation from others. We might feel particularly charged to express anger or rail against authority. If these feelings show up, invite in balance and commitment and patience to be able to see the other side of an issue. There is one more opposition present at this Full Moon—between Mars in Virgo and Neptune/Chiron in Pisces. This balancing act is between the call to practical service and the ecstasy of transcendent salvation. One method honors simple, effective action and the other honors change that comes from faith and sacrifice. What happens when you marry simple, effective service with transcendent inspiration? This Full Moon occurs the closest to Earth of any Full Moon this year. It will be potent. The ocean’s tides will be stronger, and our emotional tides will be strong as well. Notice again how easy or difficult it is to maintain stability, steadfastness, and grace. What pulls you from your center? What helps you to return to it? When there are lots of planetary oppositions it is helpful to hold a graceful, gentle stance that allows us to shift and balance subtly as the world spins around us. My interest with astrology lies with helping people see how following a practice of intention and self-awareness leads to a fuller relationship with Mystery. Astrology is a wonderful tool for this. My weekly column orients readers to the seasonal energy of each month's Sun sign in order to set magical/mindful intention for the lunar month beginning at the New Moon. Each week I write about the unfolding energies that support and challenge our intentions. The ebb and flow of the lunar cycle resides deep in our souls. Through following the phases of the Moon, we remember the natural cycles that guide us. Spring—the miraculous time of the year when earth speaks with a megaphone. It takes hardly any effort at all to feel this stabilizing power. Outdoors, under new leaf canopy, on receptive living soil, breathing rain cleaned air, it is possible to receive earth’s gift of grounding quite spontaneously. All it takes is a walk outside. A “grounding” is a intentional technique used by many Pagans to center themselves, connect with the earth, and open fully to the present. It is a highly useful practice. While the Sun in is the Fixed Earth sign, Taurus, it is good idea to bring attention to this felt sense of what grounding is, soaking up the experience, helping our cells and souls to remember what grounding feels like for those future times when we will need this tool to return to ourselves and the present moment. Walking outdoors in the Spring, I experience a natural grounding when my feet open on their own into the soft earth, my breathing slows as I listen to bird songs, trees ask me to elongate my posture to mirror their grandness. Present and open, the stress of my day falls away with ease. This is the gift of earth—stability, steadfastness, and grace. At the New Moon in Taurus, we have the opportunity to set intention around the earth qualities we need in our lives. New Moon: Dreaming. 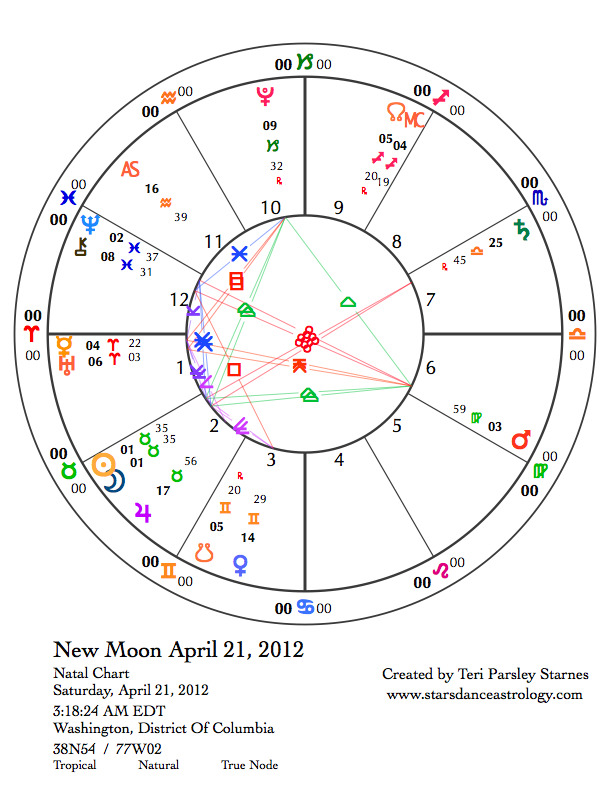 The New Moon phase begins on April 21 at 1° Taurus. This first phase of the Moon is a time to dream about what our souls need right now. Present in the sky is a reprise of the Grand Earth Trine of last month. Trines create harmony since the planets involved reside in signs of the same element. The allies who can help us form our earth intentions are Pluto in Capricorn, Mars in Virgo, and the Sun and Moon in Taurus. When Mars and Pluto work together, great power is possible as the planets of action (Mars) and transformation (Pluto) align. Earth can have a calming influence, and we all need it as Uranus and Mercury approach an exact conjunction in Aries the day after the New Moon. Mercury rules the mind as well as the nervous system; as these two planets contact each other, we can experience more tension, frustration, and impulsivity, as well as sudden insight and creativity. Sometimes this energy serves in pushing us out of inaction, but it is possible to infuse our actions with intention and mindfulness if we remember the grounding cord of earth. Mental energy really heats up when Mercury passes the degree of its last retrograde station on April 23. The push and pull between acting and being will be a primary energy to notice this month. 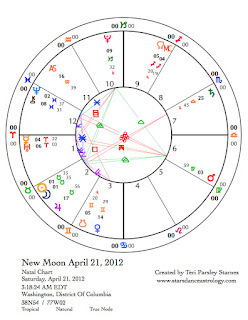 The opposition of Mars in Virgo and Neptune and Chiron in Pisces adds another layer to the Grand Earth Trine. If Mars is about action, Neptune and Chiron diffuse that impulse with feelings of vulnerability, compassion, and transcendence. In fact, the best way to tap into earth intention this month may be to release conscious intention altogether and let ourselves dream our way through the whole cycle! Remember that vulnerability and grief can be powerful ways to feed the soul. If you feel out of sync with life, it may be that your soul is asking you to retreat from striving and let yourself be. Crescent Moon: Beginning. The crescent Moon phase begins April 25. The waxing Moon at this time can be observed after sunset in the west guiding us into the first steps of manifesting our intentions. This phase feels like a breaking away from the past. The Moon is in Gemini stimulating us mentally. Notice how important communication becomes. Truthtelling will play an important role in this initial phase of manifestation. 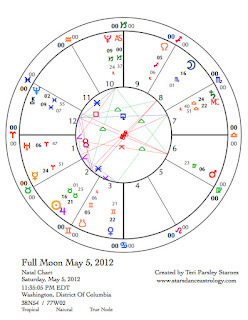 On April 25 Mercury will square Pluto. We may have to speak or listen to uncomfortable truths at this time. How do you speak to power? What are your patterns when you have to have uncomfortable conversations? How is your truth received? Does meeting this challenge reveal something important about you? As the Moon slips into Cancer after midnight* on April 26, the energy calms a bit since Cancer is in a favorable sextile aspect to the Taurus energy that began the month. However, there are dark undertones to this day. There may be conflicts around who is in charge or around different ways of taking care of things. April 26 and 27 are great days to work and play around the home and in the garden. The week ends (on Saturday) with the Moon in Leo on April 28. This is the last day of the Crescent phase. The creative energy that Leo loves to contribute propels us forward. This is a great day for trying something new, having fun being creative, and seeing how this relates back to the dreams that began at the Taurus New Moon.